GBP/USD leans lower after Parliament voted for indicative votes. A broad range of options paralyzes Sterling for now. The technical picture is directionless, just like Brexit. GBP/USD is trading around 1.3200 in choppy, yet range-bound trading. Late on Monday, Parliament voted in favor of holding indicative votes on Brexit. Many see the House of Commons taking control, but the votes are non-binding. PM Theresa May says the government is not obliged to follow Parliament’s guidance. However, after losing control of the extension to the EU and losing control of the Brexit process to her MPs, they may take one step further and turn it into a binding vote. As many suggestions may arise from Wednesday’s process, leading pro-Remain MPs may opt for a ranking system in which the one offer eventually emerges, making it harder for the government to ignore it. And while the government lost three ministers that voted with the indicative votes measure on Monday, it gained a surprising supporter. Jacob Rees-Mogg, the head of the eurosceptic European Research Group (ERG) said that he now supports the deal, as the alternative is no Brexit. The shift in JRM’s position does not mean the deal can pass. Not all ERG members will follow him and the Northern Irish DUP remains vehemently opposed to the accord. New elections are also touted. Amid all the options and possibilities, GBP/USD stuck in a range. Some analysts say Sterling has become “untradable.. Eventually, a new direction will emerge and GBP/USD will move quite a bit. The question is where, and there is no clear answer. Elsewhere, UK Mortgage Approvals dropped sharply to 35.3K. In the US, CB’s Consumer Confidence is projected to remain upbeat. Fears of a US recession have somewhat receded and markets are calmer now, but the mood can change. 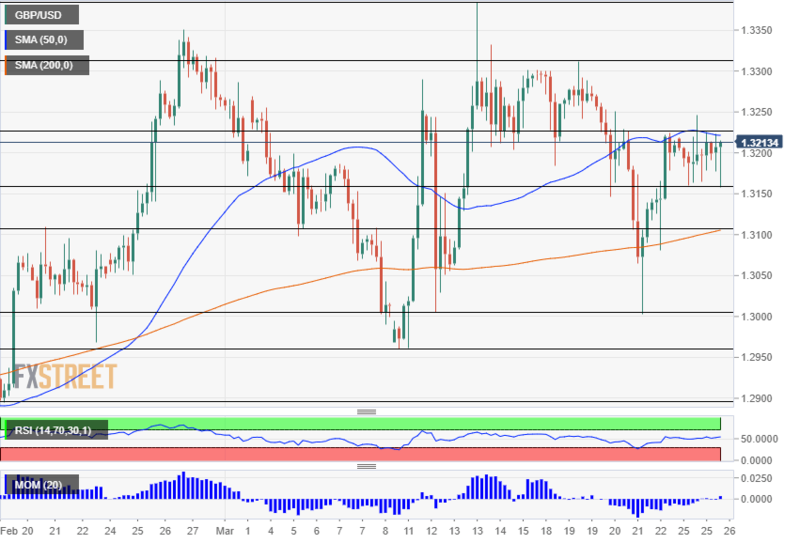 GBP/USD is trading just below the 50 Simple Moving Average and well above the 200 SMA on the four-hour Chart. Momentum and the Relative Strength Index are roughly balanced. All in all, cable lacks a direction. Support awaits at 1.3160 which was a low point earlier on and also on Monday. 1.3105 is where the 200 SMA meets the chart. 1.3005 is a swing low from last week. It is followed by the double bottom of 1.2960 and then by 1.2895. 1.3225 was a high point last week if we ignore the spike seen on Monday. 1.3310 capped cable last week and the cycle high of 1.3388 is next.